Its the Shanghai Masters. 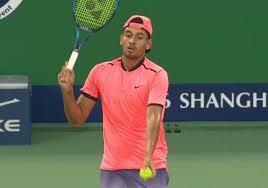 And Nick Kyrgios is making an early exit. His defeat to world number 110, Mischa Zyerev would only be a shock if the Australian was giving it 100%. Which he isnt. Complaining of boredom and tiredness, Nick once again incurs the wrath of the Australian sporting community with an un-committed performance. And of course the pundits start hawking the same questions…’Why does he do it?’…‘where’s his respect for the game?‘…’What could he achieve if he was really bothered?‘. None of which seems to trouble Nick Kyrgios. He’s making his way nicely up the rankings. And occasionally he has days like this. Every ‘genius’ player has an element in their make-up that is not-normal. It comes with the territory. Over time it can get balanced out by high-level achievement and universal recognition. Until then the dark side of genius will hold court sometimes. With Nick it can get triggered by a sense of unfairness or injustice. Usually involving officials or the governing body. It’s like he feels cornered in an Us v Them situation. And when he feels that way. the default setting is to show how little he cares. I’m not going to fight you. Because you are simply not that important to me! It’s his way of getting the message across. Most players mask their sense of uncomfortability. Nick Kyrgios doesn’t. He lets the world know what he is experiencing. As if he hasnt developed the normal filters that others use to separate out different aspect of their personality. He doesn’t ask you to approve. He simply cant help himself. For after all, conformity doesn’t sit easily alongside the sensitivity of high-level talent. Note: The dark side of genius can have has it’s roots in being misunderstood. The player sitting on a high level of talent, develops an ‘outsider’ psychology, if they feel that people, especially in authority, don’t understand them.